FANBOY PLANET.com . : mc-briangreene :. That's it. 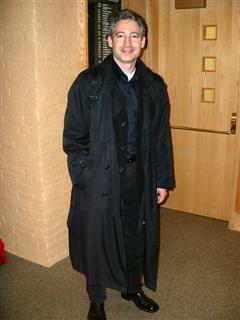 He's a man in black. Okay. The studio gave us this one, but it was hard for me to pass up -- a chance to talk quantum physics on Fanboy Planet? Ordinarily, I couldn't even begin. But Brian Greene, a professor of Physics and Mathematics at Columbia University in New York, probably can't stop. 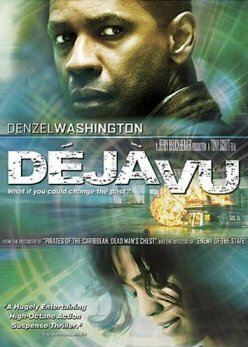 He schooled Tony Scott and Jerry Bruckheimer on how to make the unbelievable in the film Déjà Vu somewhat more believable. FBP: You work in the field of quantum mechanics and String Theory. Do they have anything to do with string? Brian Greene: Quantum mechanics is the body of physical laws describing things that are very small, like atoms and molecules and so forth. And String Theory tries to go yet smaller and describe the basic entities that make up everything. The theory suggests that the basic entities are tiny vibrating filaments that look like tiny pieces of string. That’s where the string comes in. FBP: So how does this connect with the possibility of time travel and Déjà Vu? Brian Greene: There’s a theory that crops up in Déjà Vu concerning the possibility of the existence of parallel universes and one of the ideas that comes out of quantum mechanics is that what we see around us is but one of many universes and that there are many universes alongside ours and that in those universes we may or may not exist. FBP: The million-dollar question is whether time travel is possible. Will we ever go back to the future or vice versa? Brian Greene: You need to break that question into two pieces. Time travel to the future is one sort. Time travel to the past is the other sort. Time travel to the future is completely within the laws of physics as we understand them. In principal, if you want to know what the earth will look like ten thousand years from now, then Einstein laid out a blueprint of how you would accomplish that: you build a spaceship, you travel near the speed of light for a certain period of time, you come back, and when you step out of your spaceship you will be just a year older, but earth will be ten thousand or a hundred thousand years older and you’ll have jumped into the future. Building that ship is something we can’t do as yet but in terms of physics it’s perfectly within what we understand. FBP: And travel to the past? Brian Greene: That’s a much more thorny issue. Traveling at the speed of light wouldn’t help you. You’d have to make use of wormholes, which is what happens in Déjà Vu. It’s conceivable that if you manipulate the openings of wormholes adequately it would not only be a short cut from one point in space to another but from one point in time to another. That’s the idea of the film. We admit it. We've got product to sell here, people. FBP: How did you become involved with Déjà Vu? Brian Greene: I got a call from Bruckheimer Films saying they had seen a television series I did called The Elegant Universe, which is based on a book I wrote, and that was an attempt to bring some pretty complicated ideas about String Theory and quantum mechanics to a general audience. So the idea was for me to meet with them and explain some of the physics they needed regarding wormholes and relativity in a way that they and Tony Scott and the writers would understand. So I went out and stood in front of a blackboard and explained relativity to Jerry Bruckheimer, Tony Scott, the writers and various other people connected to the film. FBP: Was there a test at the end and who was top of the class? Brian Greene: They were all very smart and it impressed me that they knew that they were dealing with cutting edge ideas and they wanted to stay as close to the truth as they could. I think the philosophy of everybody in the room was that they were going to have to break the rules because ultimately they were making an entertainment, but they didn’t want to just randomly make things up. And I think that was great. So the film bends some of the rules of physics but not in a way that’s ludicrous. FBP: Did you meet any of the actors? Brian Greene: I spoke quite a few times to Adam Goldberg, who plays one of the team of scientists working with Denzel Washington. A film crew also came to my classroom and filmed me for an hour at the blackboard explaining things. The idea was to give Adam and some of the other cast members a model of how a scientist talks about things, and I thought he did a great job in the film. FBP: Did you see yourself in his performance? Brian Greene: He didn’t base his performance on me in any way, shape or form but certainly the way I try to explain wormholes in terms of bending paper and connecting the corners, that’s there in the film and it was fun to see that that made it in. FBP: Most Hollywood films portray scientists as a bit batty. Was it nice to see something different or are real scientists batty anyway? Brian Greene: There are many examples of the wild-eyed scientist in movies and sometimes its suitable to the comedy – Back to the Future for example. But there have been several attempts more recently at realistic portrayals of scientists. Contact with Jodie (Foster) was pretty good and I enjoyed it a lot. I liked Memento very much – I’m not sure whether you would call it science, but I thought it was a wonderful exploration of time and the mind. I liked Sliding Doors, which was about parallel universes in a way, and I loved Eternal Sunshine of the Spotless Mind. Many of the things in Star Trek are way beyond what we can imagine, but I’m a huge fan of Star Trek, though I don’t wear pointy ears or anything. FBP: So is Hollywood good for science? Brian Greene: I think it’s very positive. A film like Déjà Vu, even if it’s not completely scientifically based, it gets people to think about issues of time and time travel and some of the paradoxes of the universe and I think that makes them more receptive to the real science. FBP: Is it important for ordinary folk to understand things like String Theory? Brian Greene: The critical issues that we face as a world community, from global warming to stem cells, to genetic modification, to nuclear proliferation, to pandemics will all have to be confronted by science and a better-informed public can make better decisions. But what really fires me up is that science is wonderfully enriching and exciting. I think it’s a great loss when people don’t know about it because they find it intimidating. FBP: If you could travel into the future where would you go and what do you think the world would be like? Brian Greene: I don’t think we can predict what things will be like, which is what would make it so exciting. Even a hundred years from now, who knows? Because when you look back to the 1920s, you realize that if you had asked any of the people who were at the forefront of quantum mechanics what will this be good for, I don’t think they would have been able to predict that it would yield your cell phone and your computer and all manner of medical technology. Without quantum mechanics none of that would be here. Order Deja Vu from Amazon now!